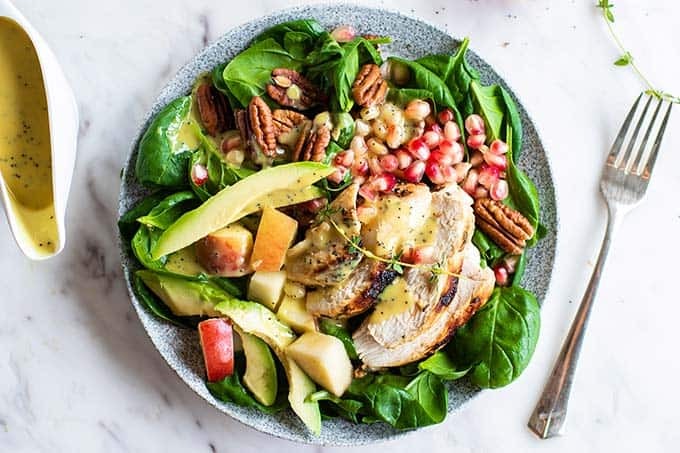 This healthy Chicken Spinach Salad with Avocado, Pomegranate and Pecans is packed with fall flavors and healthy fats. The perfect satiating paleo salad to meal prep or serve for dinner. I will be honest here — I am not the Meal Prep queen people think I am. You will never open my fridge and see perfectly portioned meals ready to eat at lunch. On the rare occasions I actually do, I am SO OVER THE MOON happy about it. When I do meal prep, it’s usually just salads. Really, what we all want to eat more of, but struggle to when we aren’t prepared, is MORE VEGGIES! 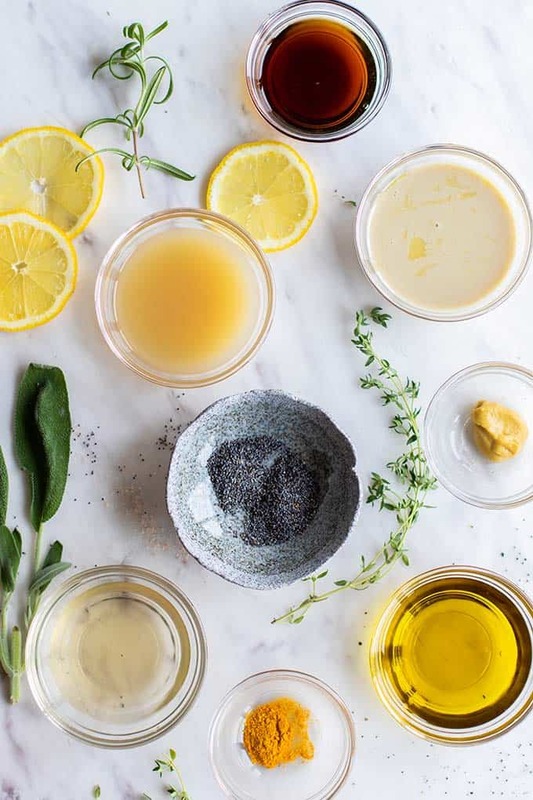 Another thing that makes it more enticing to eat salads all week is having a healthy and flavorful salad dressing ready to go. 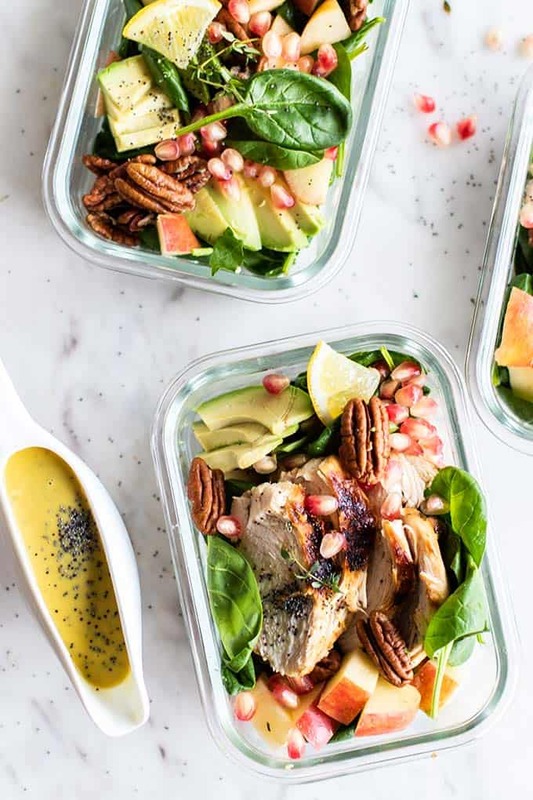 My Poppyseed Honey Mustard Salad Dressing is exactly that — you will make salads just to have something to pour this onto! I adore salads with a balance of savoury and sweet, crunchy and creamy. This salad has it all! Pomegranate Arils: For little pops of sweetness and TONS of antioxidant power. Apples: More seasonal crunch and sweetness. Avocado: Hello, healthy fats and salad-staying-power! Pecans: What nut seems more fall-seasonal than pecans? Creamy Poppyseed Honey Mustard Salad Dressing: Developed exactly for this salad – made creamy using tahini, not mayo! So whimsical, it will brighten up any chilly day. And then, cook up some herb marinated chicken. You won’t be sorry that you took the time to allow the chicken to sit in herbs prior to grilling it! It cooks up so juicy and full of flavor. Sage always reminds me of Thanksgiving! To marinate the chicken, I love to use chopped fresh herbs – rosemary, thyme and sage. If you don’t have fresh herbs, definitely just use dried! I do when I don’t have access to fresh ones. So what are you waiting for? Get your salad game on this week! If you make this recipe, I’d love for you to share it with me! Remember to use the hashtag #SunkissedKitchen on Instagram! 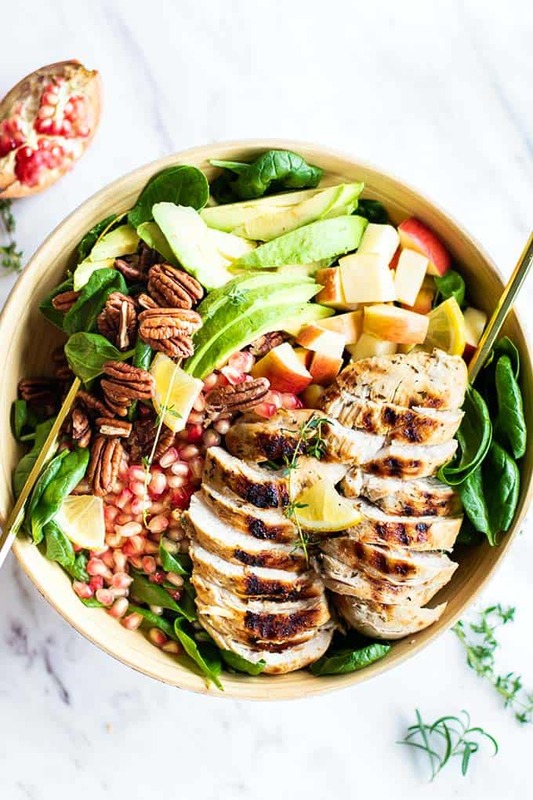 A satiating winter salad topped with herb marinated chicken! Have these healthy spinach salads prepped for healthy lunches all week long. Prepare the chicken by marinating it in a bowl with olive oil, lemon juice, salt and herbs. Marinate for at least 30 minutes. Grill the chicken on a grill pan, about 8 minutes per side, until browned and cooked through. Slice chicken. Combine all salad ingredients, and serve with poppyseed honey mustard dressing. *Nutrition Facts do not include Poppyseed Honey Mustard Salad Dressing. 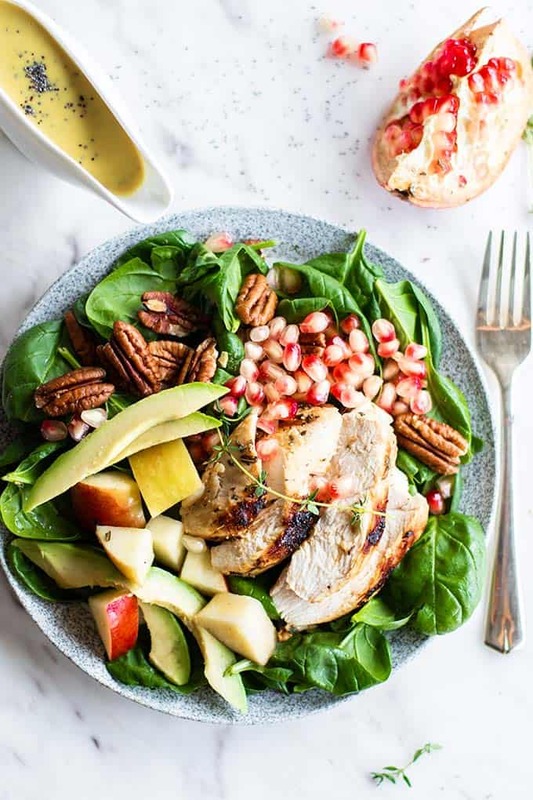 This Chicken Spinach Salad with Pomegranate post may contain affiliate links, meaning if you make a purchase, I will receive part of the sale as a commission. This helps me continue to bring you lots of fresh and inspired recipes! I love every single ingredient in this salad, it's just spot on! Pomegranite arils are just my favorite salad add-on. But you might want to rename it a fertility salad or "man salad" because anyone struggling with any type of those types of those issues will greatly benefit from all the nutrients loaded in this salad. You just listed in this salad only, the top five foods a women (and any guy actually) needs to be pounding for healthy reproductive health! Love the gorgeous photo's. I wasn't aware of that Laura! Maybe I will have to make another one and call it that :) It was a perfectly melding of ingredients- the first time I made it, it wasn't a plan. It was leftovers from other ingredients thrown on a plate when I had forgotten to make dinner, and it just worked out to be such a perfect combination. This is lovely! I would eat this right up! That would be awesome. That would be a flashback for him! Pomegranate can make anything that much more special! Love how gorgeous your pics are!! Thanks Ami. I think I'm going to start putting pom arils in every recipe just so they can sparkle in my photos. What a beautiful salad. It is something I will have to make this weekend. Thank you for sharing. Love this seasonal combination. We're just starting to see pomegranate here, and I got the most beautiful fresh spinach I've ever seen in my CSA box yesterday. Looking forward to trying this! Ah, CSA boxes! Another thing I miss from the States. I love the addition of those gorgeous pomegranate arils! This looks RIDICULOUSLY amazing - yum! 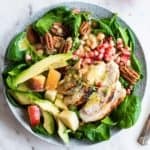 I've been indulging a lot lately - Fall always makes me crave rich comfort food, so I need to make sure I'm balancing that with lighter dishes -- will definitely try your salad, looks light, healthy and delicious! This looks AMAZING! I love using pomegranate arils in things, and absolutely drool over avocado. Will be pinning! No, it's not strange that you look forward to holidays like Halloween. I love Halloween, all the holidays really, and I don't have kids. And my neighbors & co-workers do benefit from all of my holiday cooking. I love this salad, I'm on the hunt for recipes that use pomegranate. I'll definitely try this one. Visiting from SITS Sharefest. Have a great Sunday! This looks so delicious and refreshing! I love a salad with great flavor! I would love it if you'd link this up to the Frugal Crafty Home Blog Hop--our readers love recipes like this! Thanks Carrie! I will jump over there and link it up. I appreciate the invite! Thank you Joan! It's a wonderful salad. 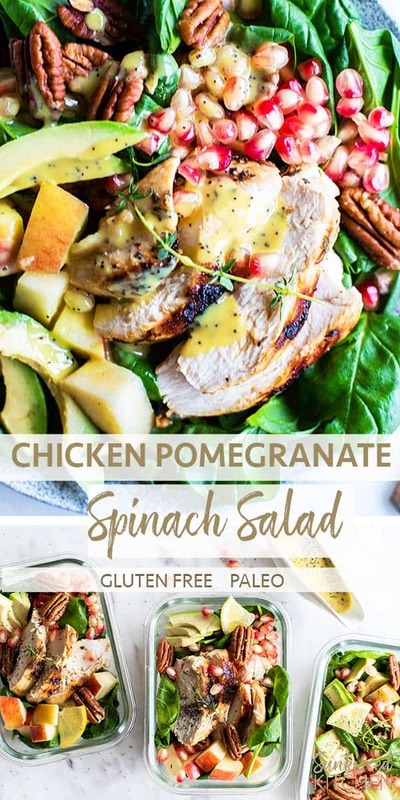 I've been keeping pom arils in the fridge every week so I can make this salad with any left of chicken for lunches. What a fun looking meal. I've never put pomegranate in anything before. Can't wait to try it out. Thanks for linking up to Snickerdoodle Sunday! Pomegranate is an awesome salad component! A fun, sweet crunch, that looks festive and beautiful! This salad looks absolutely delicious! I've been looking for new ways of incorporating avocado into my salads…can't wait to try this! Avocados are such an easy way to dress up a salad and add nutrition! They are one of my fav add ins! What a delicious salad! It's light and full of flavor. I used leftover rotisserie chicken and substituted white wine vinegar for lemon juice, plus added a little bit of honey to my dressing. I will be making this salad often, that's for sure. Thanks for a great recipe! Thanks for letting me know Izabela! I love the subs you made - rotisserie chicken makes salads so easy and I use it all the time. Pomegranate on everything this time of year, right? !